AUGUST 25th UPDATE: The deadline has passed and we did not receive the numbers needed to qualify for a private tour. A few of us are attending anyways so if you plan to go and wish to meet up then give us a shout at info(at)themangolab.co.uk. 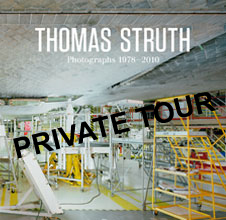 The Mango Lab is organising a 60-90 minute private tour at the Whitechapel Gallery exploring one of the most important photographers of the late 20th century – Thomas Struth. Our Thursday evening private tour will include a gallery representative giving our group insight into Struth’s work and answer your questions around this photographer’s visual language, style and intentions in contemporary photography. We will see ” life-sized images of tourists enraptured by art, intimate family portraits, epic panoramas of colossal technology projects and quiet pictures of empty streets…. His photographs reveal the cultural, psychological and historical undercurrents beneath the surface of modernity”. “This exhibition spans early black and white prints to recent colour photographs that are up to 4 metres long. These include images of sites at the cutting edge of technology such as the Space Centre on Cape Canaveral. Their overwhelming scale evokes an industrial sublime; built by us, yet chillingly inhuman, these structures encapsulate the great contradictions of progress. A film combining rare footage of Struth on location and working in the studio provides an insightful portrait of this pioneering artist. Screenings take place every 45 minutes starting at 11:15am in the Zilkha Auditorium”. Fee: 25.00 (includes general admission and admin fees, Gift Aid, tour guide fee and taxes). Minimum 10 people. DEADLINE FOR BOOKING IS WEDNESDAY AUGUST 24th NOON. SEPTEMBER 1 IS AVAILABLE BUT PRIVATE TOURS ARE BOOKED ON A FIRST COME FIRST SERVE BASIS AND ARE SUBJECT TO AVAILABILITY. REFUNDS WILL ONLY BE AVAILABLE IF WE HAVE TO CHANGE THE DATE AND YOU CANNOT MAKE THE NEW DATE.